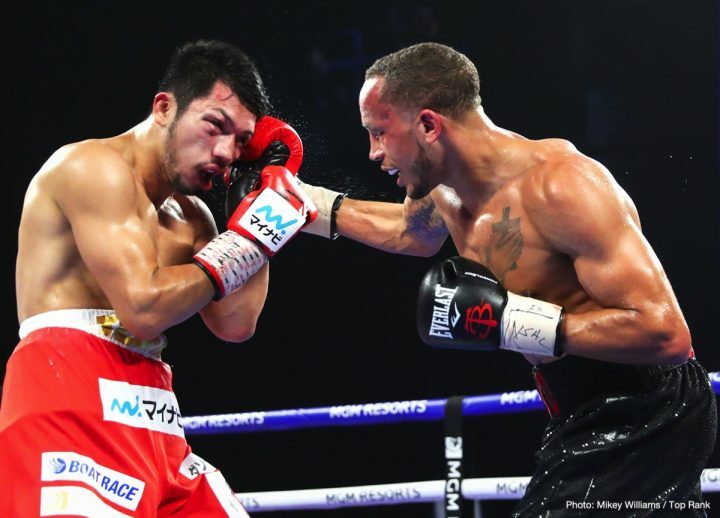 By Mike Smith: Rob Brant (24-1, 16 KOs) could be next up for former middleweight champion Gennady ‘GGG’ Golovkin (38-1-1 34 KOs) after his 12 round unanimous decision upset win over World Boxing Association secondary 160 lb champion Ryota Murata (14-2, 11 KOs) last Saturday night at the Park Theater in Las Vegas, Nevada. Brant is a talented middleweight with power, speed, size, youth and an ability to throw nonstop punches all night long without tiring. The work rate that Brant showed last night against Murata would have likely resulted in a fighter like Golovkin causing Saul Canelo Alvarez to fall apart if he’d been able to throw as many shots. Brant’s 1,200 punches thrown against Murata makes him a threat to a fighter like Golovkin or Canelo, due to the fact that both fighters have shown stamina problems in their last fight. Golovkin lost to Canelo in their rematch on September 15 as a result of him not being able to stay on top of the Mexican star to throw enough punches to wear him down. Had Golovkin thrown 1,200 punches like Brant did against Murata, he would have likely knocked Canelo out due to the high number of shots he would have hit him with. Brant might be too high of a risk for Golovkin without him getting much credit if he wins the fight. Golovkin vs. Brant wouldn’t be a big money fight for him, but its’s probably still his best option if he wants to win another world title. 4. Take on Rob Brant for the WBA ‘regular’ 160 lb title, and be perceived as not the real champion by boxing fans if he wins the fight. Canelo holds the true WBA middleweight belt in possessing the WBA ‘Super World’ 160 lb title that he won last month in beating GGG. Golovkin wouldn’t get the kind of money fighting Brant that he would have received in a fight against Murata, which could make it unlikely that he takes the fight with him. Golovkin’s payday for his next fight now potentially will take a nosedive with Murata’s loss. For Golovkin to get a big money fight, he’s going to need to show some imagination by fighting someone from the super middleweight division like Callum Smith, Gilberto ‘Zurdo’ Ramirez, David Benavidez or possibly the winner of the Danny Jacobs vs. Sergiy Derevyanchenko fight. Brant had a simple game plan to defeat the 2012 Olympic gold medalist by averaging 100 punches thrown per round for the entire 12-round fight. Murata, 32, is an economical puncher with excellent punching power, but not equipped to throw more than 65 punches at the most per round. Brant made sure to throw many more punches than that, and that made it easy for the judges to give him the victory by the scores 118-110, 119-109 and 119-109. Murata came into the fight with the idea of facing Golovkin, 36, in early 2019 in a big money fight in Tokyo, Japan. The loss for Murata ruined those plans, so now Brant is next in line for Golovkin to potentially face. Unfortunately for Golovkin, there won’t be nearly as much interest from the boxing public in a fight between him and the little known 28-year-old Brant than there would have been had he faced Murata, but oh well. That’s how it goes sometime. Murata’s promoter Bob Arum of Top rank kept a stiff upper lip afterwards, not showing sadness or any kind of disappointment at his fighter’s loss to Brant. Before last Saturday night, Arum was excited bout the thought of matching Murata against Triple G in a huge fight in Japan in early 2019. The defeat for Murata likely changes Arum’s plans, because he can’t make the Golovkin-Murata fight without the boxing public expressing distaste in that match-up. Golovkin would be labeled as a ‘cherry-picker’ by the boxing fans if he were to fight Murata at this point instead of Brant. Even if Golovkin faces Brant, he’ll still be seen as a ‘ducker’ by fans for him not agreeing to take the arguably tougher fight against interim World Boxing Council middleweight champion Jermaall Charlo after the WBC ordered the two to face each other. Brant was the underdog last Saturday in taking on a very good fighter in Murata in Las Vegas. It was thought that it was a sure thing win for Murata, but things didn’t work out well for him. Brant had looked bad in losing last year against former light heavyweight champion Juergen Braehmer in the World Boxing Super Six 168 lb tournament. Brant had no business fighting in the WBSS super middleweight tournament against fighters with the kind of size of the 39-year-old Braehmer. That fight showed clearly that weight divisions are created for a reason to protect the smaller fighters from the bigger guys. It doesn’t matter that Braehmer was pushing 40-years-old at the time. He was simply too big, too experienced and too talented for the green Brant. Despite the loss to the light heavyweight Braehmer, Brant is still undefeated against fighters from the 160 lb weight division. He’s yet to taste defeat from guys in the middleweight division. When fighting opposition his own size, Brant is a tough not to crack, and Golovkin might want to think twice before taking him on. 2,782 boxing fans showed up to see Brant pull off a big upset over Murata in sending the Japanese fighter back to the contender ranks, possibly for good. This was Murata’s second title defense of his WBA World middleweight title that he won last October in stopping Hassan N’Dam in the 7th round in their rematch. Earlier last year, N’Dam had beaten Murata by a controversial 12 round split decision in May 2017.